The ADA Restroom Trailer + 6 Station | Oahu Series is a perfect choice for your next high-traffic event. This spacious floor plan includes 3 separate suites. The women’s central suite includes 3 water-saving china flushable toilets, 3/4 height privacy door, double sinks with floating countertops with metered faucet and large shatter-proof mirror. The men’s central suite includes 1 water-saving china flushable toilet and 2 urinals, 3/4 height privacy door, double sinks with floating countertops with metered faucet and large shatter-proof mirror. The ADA-compliant unisex suite includes 1 wheelchair-accessible sink, faucet, and door handle; and 1 water-saving china flushable toilet with mounted push button control module. This suite also allows for a full 360 turning radius for wheelchairs and additional assistance grab rails. The ADA suite features with a wide entry door and ADA-compliant ramp, and welcomes each guest with a One Button execution system that smoothly and quietly lowers the trailer to the ground. Abundant porch lighting and vinyl flooring ensures a safe entry/exit to each suite, no matter what time of day or night. Provide your guests with comfort with a fully climate-controlled environment maintained by air conditioning and heat strips! 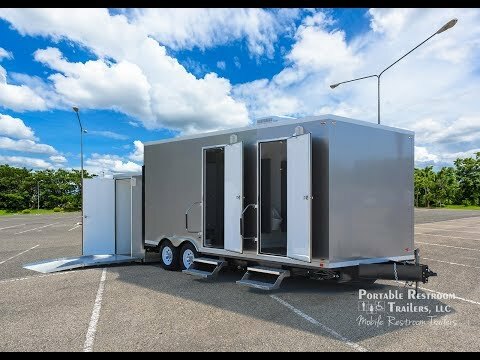 This ADA Restroom Trailer + 6 Station | Oahu Series meets or exceeds ADA Compliancy Standards in all 50 States. Option: Smarter Restroom App - The Smarter Restrooms App. is an interactive tool that allows portable restroom rentals fleet owners to monitor operational systems for portable restroom trailer(s) from your smartphone, tablet, or computer. Specifically, it will monitor waste and freshwater tank levels, power, and interior climate control.